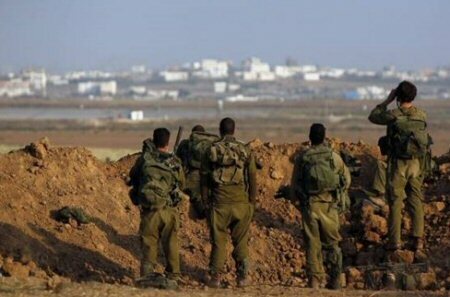 Israeli soldiers shot, on Sunday evening, a young Palestinian man, east of the al-Boreij refugee camp, in central Gaza. Medical sources said the soldiers shot the young man, 25 years of age, with a live round in his abdomen, before he was rushed to a hospital. The Palestinian was instantly moved to surgery in the Al-Aqsa Hospital, in Deir al-Balah, in central Gaza. He was shot when Israeli soldiers, stationed across the perimeter fence, fired many live rounds at Palestinians on their lands in that area. On Saturday, Illegal Israeli paramilitary colonialist settlers killed one Palestinian, identified as Hamdi Taleb Sa’ada Na’san, 38, while the soldiers and settlers injured at least 30 others, after dozens of colonists attempted to invade the northern part of the al-Mughayyir village, east of the central West Bank city of Ramallah, and were intercepted by the villagers. On Saturday at dawn, Israeli police officers shot and killed a Palestinian man, identified as Riyad Mohammad Hammad Shamasneh, 37, from Qotna town, northwest of occupied East Jerusalem, after the officers opened fire at his car in Bab al-‘Amoud (Damascus Gate) area. On Friday evening, the soldiers killed a Palestinian teen, identified as Ayman Ahmad Othman Hamed, 16, from Silwad town, east of the central West Bank city of Ramallah, and wounded another Palestinian, in addition to moderately injuring a young man in ar-Reesan Mountain area, west of Ramallah.